Contemporary Australia is a case of dependent, high-technology liberal militarization, but with distinctive characteristics pointing to a model that must look beyond standard concerns with increasing national defense budgets, more and better weapons systems, an “exceptionalist” approach to immigration security and a predilection for use of military force in international affairs. In a world and time where militarization is a global norm embedded in globe-spanning military alliances and world-wide networks of foreign military bases, discerning the lineaments of one particular national instance can be both difficult and potentially misleading. In liberal democracies, national self-conceptions resist identification with the harsh implications of reliance on, or valorization of, military force, unless it can be viably represented as defense of freedom, just war, or wars against unspeakable Others. And in the case of liberal democracies originating in a settler state with ongoing unrecognized conquest of indigenous peoples – think Australia, the United States, Canada and Israel – the racially inflected violence at the foundations of state-formation and national identity continues to ramify through the default settings of contemporary foreign policy. All three qualities distinguish the contemporary pattern of Australian militarization from the standard versions of either exceptionalist or liberal militarization. 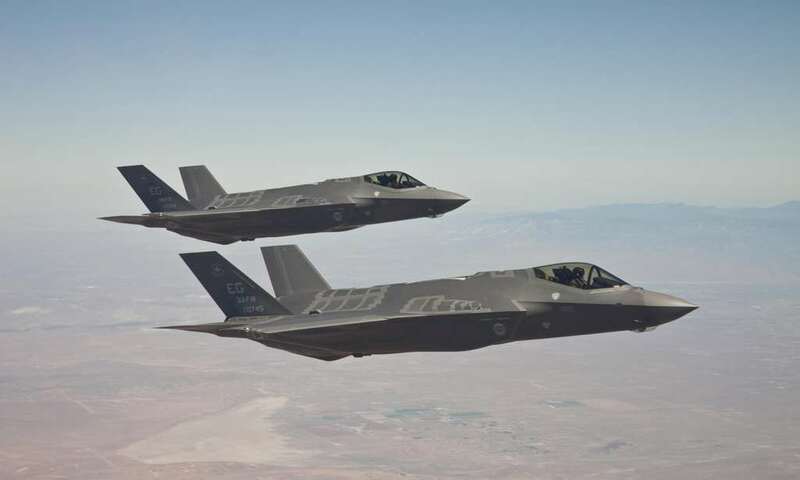 US F-35 Joint Strike Fighters in flight testing. The Australian government has approved the purchase of a further 58 of the warplanes at a cost of $12.4bn. Photograph: Lockheed Martin/AAP. By the standard indices of national-level militarization, Australia is now a serious instance, albeit an unusual one. The world’s sixth-largest arms importer, post-9/11 Australia embarked on a large capital expenditure program on defense that will see virtually all major weapons systems and support platforms replaced or upgraded in the next two decades. Defense spending has been growing continuously since 2000, reaching $27.3 billion in the current fiscal year, a 6.5 percent increase in real terms over the previous year, including a billion dollars for current overseas deployments in the Middle East and Afghanistan. Current government planning to bring defense spending from 1.9 percent of gross domestic product (GDP) to a sustained 2.0 percent in coming years will involve annual real increases of 4.7 percent, meaning that defense spending will have doubled in real terms from 2005-2025, including $153 billion for increased defense materiel capacity. These tension-sets derive at root from the anxieties of a small, settler-colonial state, uneasily occupying a conquered continent, identifying deeply with its imperial origins on the other side of the world, and fearfully anxious about its relations with its geographical and cultural environment. Identity powerfully structures how the map is read for strategic interests. On the standard Australian reading, “help” looks far away. Serious pursuit of “self-reliance” is seen as a brave gamble. With a nod to the shade of past self-reliance policy, the essence of Australian defense policy post-9/11 and in renewed fear of China today is an intensified, broadened and tightened version of the alliance relationship with the United States. Now in its seventh decade, the Australia-US alliance is an historical chameleon, shape shifting from its original rationale as a US guarantee against post-Second World War Japanese remilitarization, to an imagined southern bastion of the Free World in the global division of the Cold War, on to a niche commitment in the global war on terror, and now a new, if slightly hesitant, role in a US-led faux containment revenant against a rising China. The century-long tradition of deployment of Australian armed forces in distant theaters in service of its alliance protector – first Britain, then the US – continues today, with substantial Australian ground, sea and air force elements still deployed in the US-led wars in Afghanistan (almost continuously since 2001 to the present), Iraq and the Western Indian Ocean (2003-2009; and 2014 – present ) and Syria (2015 – present ), and large support elements in Persian Gulf bases (2002 – present ). Servicing alliance requirements has meant that Australian force structure reflects these underlying tensions, as can be seen, for example, in the roles assigned in theory and practice to Australia’s range of new major weapons-platforms upgraded in recent years, in all three services. To take the example of advanced military aircraft, Australian doctrine today still nominally emphasizes the defense of the sea-air gap surrounding the continent, immediate South Pacific and archipelagic Southeast Asia. Accordingly, defense planners have always sought a “knowledge edge” over neighboring armed forces rooted in preferential access to US military technology denied even to other close US allies such as Japan as the “reward” for a US-deputed sheriff role in the region and in constant support for US-led wars. Accordingly, the Royal Australian Air Force’s large but aging F/A-18 fighter-bomber force, mainly deployed to the continent’s northern approaches, are to be replaced in coming years by more than 70 F-35 Lockheed-Martin Joint Strike Fighters. But RAAF Hornets and Super-Hornets have also long been deployed to Iraq and now Syria in high-tempo alliance operations. For the US, the bombing contribution of the Australian F/A-18s, while politically helpful, has been outweighed by the utility of the accompanying deployment of a technologically advanced US-sourced RAAF Wedgetail E-7 airborne early warning and control aircraft, based on a Boeing 737, and designed to be highly interoperable with US forces. A similar set of defense doctrine contradictions was embodied in the protracted and intense intra-government debate about replacing an ageing small submarine fleet. This was eventually resolved in 2016 with the decision to commit $39 billion to build 12 4,000 tonne conventional diesel-electric submarines based on a DCNS-Thales design derived from the French Barracuda-class nuclear submarine. Once again, doctrinal concerns for a submarine capability designed for defense of the continental sea/air gap and archipelagic Southeast Asian areas of direct strategic interest to Australia appeared to be trumped by advocacy rooted in alliance concerns for capacity to conduct very long-range coalition-support operations centering on a blockade of Chinese waters – a choice with considerable consequences for design requirements and for the Australian strategic relationship with China. Australia hosts a number of US-related military facilities. Today, none of these are solely US bases, but are joint facilities, each with a greater or lesser extent of US access, although in important cases such as the Joint Defense Facility Pine Gap, the degree of “jointness” is highly asymmetrical, with Australian staff sharing operations of a facility built and paid for by the US and only operating as part of global US space-based surveillance systems. Outside Australia, perhaps the best-known example involves the initiative of former US President Barack Obama’s administration to deploy up to 2,500 marines to Darwin in the Northern Territory and US Air Force fighters, refueling tankers and B-52 and B-2 bombers to Northern Territory air bases. The Marine Air-Ground Task Force (MAGTF) is on permanent rotation for half of each year, avoiding the tropical wet season where major military ground activity becomes all but impossible, when its core elements from the 31st Marine Expeditionary Unit return to Okinawa aboard a US Navy Expeditionary Strike Group. The number of marines in Darwin is small compared with their presence in South Korea, Okinawa and Guam, and in some respects the significance of their Australian presence is as much political as military. However, with their ADF counterparts increasingly highly integrated with US forces through training, doctrine, logistics pre-deployment, interoperability, and combined operational planning, including for coalition operations in Korea, the military significance is becoming clearer. The MAGTF and USAF aircraft utilize large ADF ground and air weapons-training ranges in northern Australia – one of which, Bradshaw Field Training Area, is the size of Cyprus – which are densely electronically connected by optical fiber in real time to both ADF headquarters and Pacific Command in Hawaii to facilitate training activities and evaluation. The clear US intention is to develop the Darwin hub into a combined contribution to US-led regional rapid deployment capability for East and Southeast Asia. To best understand the important implication of not only hosting US facilities in Australia but also the more general Australian national pattern of militarization, a wider vantage point is needed, shifting the focus of militarization from the essentially standalone characteristics of an individual nation-state to the implications of that state’s place in a networked alliance system. These networks involve US and allied military bases and deployed personnel, globally distributed elements of US-controlled but coalition-accessed space and terrestrial surveillance sensor systems, communications and computing systems – all tied to US and coalition military operations. The physical manifestations of these systems include not only easily recognizable conventional military bases with large numbers of military personnel, logistics and transport facilities and weapons platforms, but also US-controlled but coalition-accessed and hosted bases for space and terrestrial surveillance sensor systems and worldwide communications and computing systems that are essential to US and coalition military operations, and that are technologically dense, but personnel light. These make up a globally distributed, materially heterogeneous landscape of digital technology, much of which exists in an invisible Hertzian landscape constituted by the electromagnetic spectrum operated through all-too-material antennas, advanced computing facilities, sensors, data banks, communications satellites and globe-spanning webs of dedicated optical fiber. 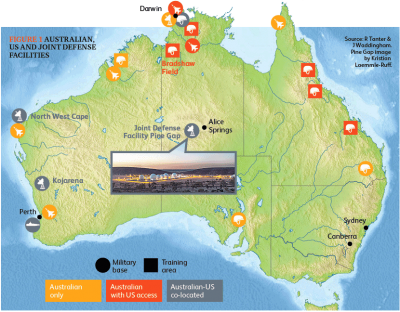 Two essentially US facilities in Australia regarded by both governments as “joint facilities” and governed by agreements under which they operate with “the full knowledge and concurrence of the Australian government” exemplify this alliance-induced global aspect of Australian militarization: the Joint Defense Facility Pine Gap in Central Australia and the Harold E. Holt Naval Communications Station at North West Cape in Western Australia. Between the two of them, Pine Gap and North West Cape are now operationally closely involved with – and indeed for the most part critical for – US nuclear-war targeting, US-Japanese missile defense, US drone and special forces extra-judicial counter-terrorism killings, the rapidly growing US capacity for space warfare, and direct support for ground and air operations in the wars in Afghanistan, Iraq, Syria, and for US combat operations in any outbreak of armed conflict on the Korean Peninsula. The idea that an intelligence facility in the center of Australia will be central to US planning and operations for a Korean war, nuclear or conventional, may appear exaggerated from the outside. This is far from the case. Pine Gap’s longstanding primary role involves its massive signals intelligence capabilities in space and on the ground, listening to a vast range of radio signals, cell phones, and radars over more than half the world from the west of Africa to the mid-Pacific, and all areas of current US military interest and operations. For half a century, one essential role of Pine Gap has been to provide US strategic planners with the locations and characteristics of enemy radars and air defenses, the better to evade, jam, or destroy them as a prelude to airborne nuclear or conventional attack. In preparation for a possible Korean war, Pine Gap’s signals-intelligence tasking schedules will have been in overdrive contributing to updates to the North Korean Electronic Order of Battle – the key to the effectiveness of US attacks on enemy assets. This will include listing the locations and characteristics of every North Korean radar, missile launcher, command center, tank and artillery array, logistics hub, ship and aircraft, and political leadership cell phones and bolt holes. Pine Gap’s secondary nuclear role involves downlinking data from US infrared surveillance early-warning satellites detecting enemy nuclear missile launches, giving the US a few minutes of warning of nuclearattack – and also priming a second strike by establishing which enemy ICBM silos have fired, and which remain to be targeted. But beyond this, through these same infrared satellites, Pine Gap detects the first seconds of enemy missile launches and calculates the missiles’ likely trajectories, passing the information to US and Japanese and South Korean missile defense systems, cueing their fire radars to search a tiny portion of the sky where the missiles are gathering enormous speed. If cued by Pine Gap, and if the missile defense system works as the Pentagon and the manufacturers advertise, US missile defenses might, just might, have a chance of firing their own missiles to hit and destroy the enemy missiles. Without Pine Gap’s contribution, at the current stage of US missile defense technology, the chances of successful interception are probably not much more than zero. North West Cape, once vital for communications with submerged US Polaris nuclear submarines, has a new critical role in an ever-more important area of US military planning, with enthusiastic Australian acquiescence. The US has installed two ground-based space surveillance systems at North West Cape under a Space Surveillance Partnership Agreement with Australia, as part of its worldwide collaborative Space Surveillance Awareness network. A refurbished Cape Canaveral Missile Range C-Band space radarhas been transferred to Australia, now operated by the RAAF to monitor space objects in low earth orbit. And a new highly advanced US space surveillance telescope to take advantage of Australia’s southern location for observation of objects in geosynchronous orbit. Both the radar and the telescope are dual purpose. Great public emphasis is given to their utility as an undoubted global good to track space debris threatening the use of congested space. Rather less publicly, great importance is attached by both the US Space Command and the ADF to the role of both in determining the locations, characteristics and behavior of adversary satellites – a critical requirement for US planning for space dominance. What is striking in this pattern of militarization is the dramatic upgrading of alliance operational integration at the heart of US planning. A third “joint facility” confirms this pattern of militarization of Australia through its willing insertion into a wider global pattern. The Australian Defense Satellite Communications Station (ADSCS) at Kojarena near Geraldton in Western Australia was originally a solely Australian facility, and still functions together with Pine Gap and a companion Australian satellite communications interception station at Shoal Bay outside Darwin as a major Australian contributor to the US-led Five Eyes global signals intelligence network. However, in the past decade, two new compounds at Kojarena have been constructed to house two ground stations for US global military communications systems. One houses three giant antennas to uplink and downlink to the satellites of the Mobile User Objective System, or MUOS, the US military’s ruggedized 3G smart phone system providing worldwide access for individuals’ narrow-band (limited volume and speed) voice, data and video communications, and military-auspiced internet-capacity military communications. The four worldwide MUOS satellite ground stations, including Kojarena, are linked by a dedicated 18,000 mile-long optical fiber network. Another new Kojarena compound also houses three antennas as ground terminals for a different kind of US communications system, the equally important Wideband Global SATCOM (WGS) system. Australia paid for one of ten WGS satellites to gain global access to the entire WGS network, especially for operations in the Middle East and Afghanistan, and two Australian WGS ground access terminals have been built for ADF use. Wideband communications networks transport huge amounts of data, and are critical operating and downlinking data from long-range armed and surveillance drone aircraft. In mid-2014, the US Defense Department informed Congress that “warfighters” would be denied access to the WGS system for “months or years” without construction at Kojarena of a communication gateway known as a teleport, for which there was “a desperate need” in the region (in addition to those in Hawaii and Okinawa). A DoD Teleportenables both the WGS and MUOS communications satellites’ ground terminal to connect to the terrestrial optical fiber network known as the Defense Information Systems Network (DISN), and through that to the “network of networks” the US military calls the Global Information Grid (GIG). Such “joint” facilities indicate a new globalizing dimension to alliance structures and to what had previously been considered as standalone national patterns of militarization, in this case of liberal democratic states. Cooperation with and reliance on US-led planet-wide communications and surveillance systems produce a type of dependent militarization that is rather different from, and deeper than, dependence derived from, say, force structure dependent on imported weapons systems. “Entanglement” takes on quite new and binding dimensions of linkage multiplicity, complexity andpotentially unavoidable consequences. The implications of such globally organized alliance drivers of national militarization may vary in time and place, but as the Australian case shows, warrant serious consideration as a new dimension of liberal militarization, and its attendant dangers. This is a slightly revised version of an article that first appeared in Global Asia, Spring 2018, Vol.13 No.1. Richard Tanter is a Senior Researcher at the Nautilus Institute and Honorary Professor in the School of Political and Social Sciences at the University of Melbourne.